In later years, Mom would sometimes buy us costumes from the store — probably K-Mart, and most likely a blue-light special. Little girls in the late ’60s and early ’70s had about two costume choices: nurse or witch. I chose the nurse. I liked those little candy pills that came in the little plastic nurse’s box. 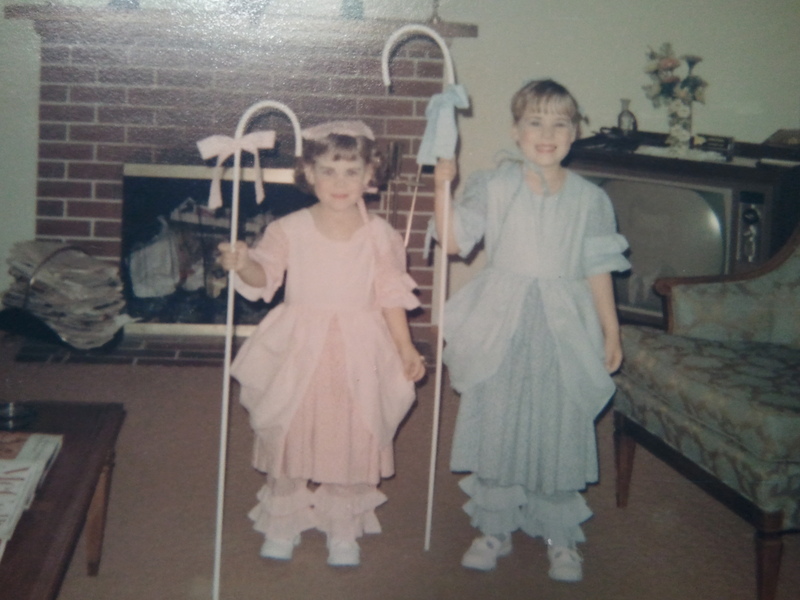 Hand-me-downs were also a part of Halloween: Coleen and Melissa would be wearing those Little Bo Peep costumes a few years later. When I was just starting elementary school, there was a super dry spell in Halloween festivities for children in the San Francisco Bay Area. There was a crazy serial killer named the Zodiac on the loose. During those Zodiac years, no trick-or-treating was allowed in the greater Vallejo area. I hated the Zodiac. I was too young to understand what was going on — all I knew was some crazy person had ruined my favorite holiday and all of us were banned to school cafeterias and community centers to celebrate our Halloween. Trick-or-treating around a cafeteria just isn’t the same once you’ve experienced the real outdoor festivities, especially when that nasty warm corn smell was still lingering in the cafeteria air from lunch time. We’d parade around the cafeteria in our costumes getting candy and snacks. Oh, and there was bobbing for apples, or as I like to call it, Hello Hepatitis! What were those adults thinking? Hey guys, let’s grab a huge rusty pail from the backyard scrap pile, fill it with water from the hose and throw some apples in it. Then for kicks, let’s have the kids dress up like dorks with crazy makeup all over their face, run around the block begging the neighbors for candy in the cold, then drag them and their runny noses over to the big rusty water pail full of apples and stick their faces in it. Then let’s have them bite at the apples with their candy-corroded teeth long enough so that their spit mixes together in the water. If one of them actually snags an apple in their teeth, they WIN!! They win an APPLE!! One time I didn’t listen to my Mom and Dad’s lecture about eating candy at night and I snuck lots of candy from my trick-or-treat bag into my room right before bed, and proceeded to eat most of it. That night, I had the dreaded “eating-candy-before-bedtime nightmare.” About werewolves. Dancing werewolves. If you missed that post, click here, or here (I tend to write about those werewolves quite a bit, apparently).